For the benefit of our members, we are launching some additional services and we do hope these will help our members to finish their projects on time and with assured quality. On an average we get 10-20 custom requests a day in forums or in our ticket system and those within the support scope are attended for free by the team and the major one's are politely refused, but that does not solve the issue for the member. To cater to such demands of our members we decided to give it a try and offer custom services at additional cost. Joomla! 2.5 has reached End of Life in December 2014 and will soon be phased out and we do intend to eventually stop supporting Joomla 2.5 products but we can not do it abruptly as members need time to plan their upgrade / migration and we totally understand the same. For those who need professional help to migrate or upgrade their Joomla! sites to latest Joomla! version, we can help. The more members move to Joomla 3, the easier it is for us to maintain our products. Custom Work Services are not available due to overload of requests. Help members finish their projects on time. Provide options to members for requests beyond product support scope. Decrease the project / product abandon rate due to lack of available services. Promote Joomla 3 based sites and help members move to latest Joomla 3 version. Manual Installation of templates or other extensions in existing Joomla site. Template upgrade & Migration - From any Joomla version to latest Joomla 3**. Joomla full site migration covering Joomla 1.0, Joomla 1.5 and Joomla 2.5 to Joomla 3. If the template is not available for Joomla 3, we may recommend use of blank or Purity III template and match the color and layout schemes. 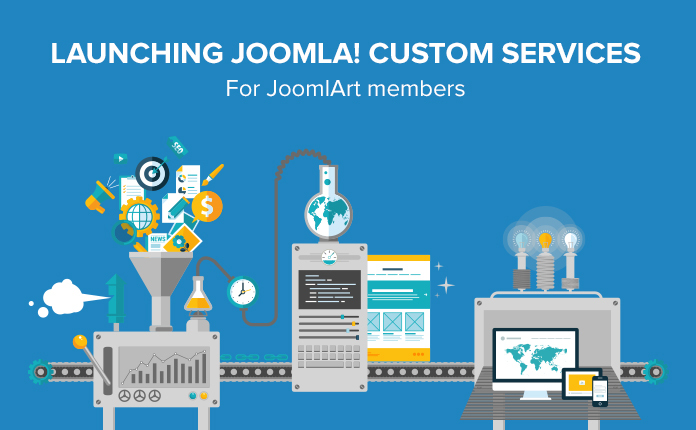 Order JoomlArt Custom Support Now!